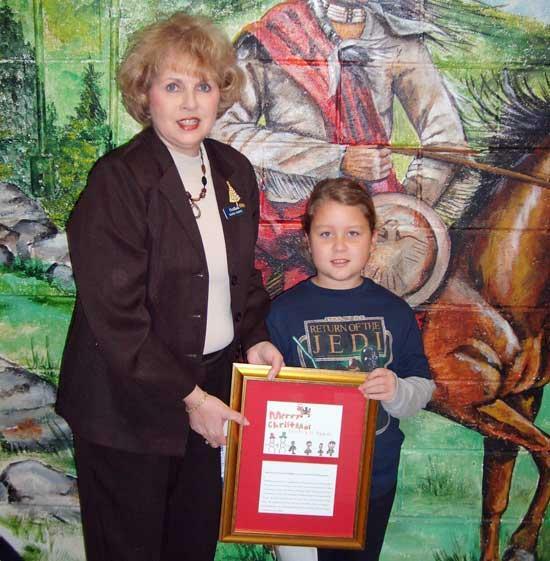 Wanda Parker, Branch Manager, Woodbury FirstBank, and art contest winner Kailee Means. FirstBank in Woodbury recently announced Kailee Means as the winner of its annual holiday art contest for third-graders at Woodland Elementary School. Her artwork is featured on the cover of FirstBank’s 2009 holiday card, and she has received a $100 educational savings bond. Every third-grader at Woodland Elementary School was provided with materials to draw a holiday picture for FirstBank. This year’s theme was “Rudolph Spends The Holidays With The Troops”. Representatives from the school selected the three finalists, who included Dalton Farrar, Mary Elizabeth Spradley and Kailee Means, and a team of judges from FirstBank determined the winner. FirstBank is one of the largest independently owned banks in Tennessee, with 44 locations and assets in excess of $2 billion. As the leader among Tennessee’s community banks, FirstBank offers its customers a broad line of financial products and services, and actively promotes initiatives that improve the quality of life for Tennesseans, with an emphasis on education in the communities it serves. Jim Ayers is owner and chairman of FirstBank and founder of the Ayers Foundation. To read more about FirstBank, a wholly owned subsidiary of First South Bancorp, Inc., visit its Web site at www.firstbankonline.com.